Lunch time can get lonely for kids sometimes as was the case with Gina Flanagan’s daughter. Gina began putting cool drawings and fun notes in her daughter’s lunch box. Her daughter really enjoyed them and so did the rest of her class. Soon Gina began getting requests from other parents for Gina’s lunch cards and the idea took off from there. Gina teamed up with another mom, Rose Cricchio, and Kids Lunch Box Cards was officially in business. I love this story about how a cool mom idea like this can be turned into a business and benefit parents everywhere. I remember when I was a kid and never looked forward to my lunch and it was always so ho-hum. I think if my mom had known about Kids Lunch Box Cards back then, it would have made my lunches (I was a very picky kid) more enjoyable. So what are Kids Lunch Box Cards exactly? Well they are the new and fun alternative to the lunch time napkin note that many parents write. 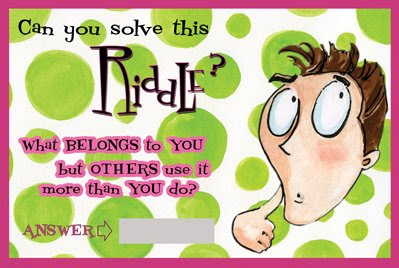 They are colourful cards on a variety of kid topics with riddles, cool facts, and questions with scratch off answers. They are geared towards kids in grade 1 through 5. Each pack contains 5 cards which will be enough for one week’s worth of school lunches. I received 5 packs of Kids Lunch Box Cards for my review. I thought the topics I received are definitely kid friendly and fun- Riddles, Mystical Little People, Looney Laws, Eww, That’s Gross, and It’s a Wacky World. I first noticed how bright and colourful these cards were and loved the cool illustrations. I tested them out on my daughter Olivia who is in grade 5. She said she was surprised to see the card in her lunch bag and thought it was a really neat idea. She loved the silly pictures and strange facts and showing all her friends what her mom packed for her. Olivia also said that many of her friends came around to see what she had each day and they wanted their moms to get some of these cards for them! Both Olivia and I love these cards and they allow parents to connect with their kids in a fun way. What used to be a regular lunch for Olivia has now become something she really looks forward to and enjoys each day. I would also like to get more of the Kids Lunch Box Cards to use on my youngest, Bridget, but I will need to wait a few more years until she can read! I know she will really enjoy them too. Kids Lunch Box Cards can be purchased from their website and the a 5 pack of card (one week worth of school lunches) is $4.95 per pack. Kids Lunch Box Cards are an innovative and fun way to stay connected with your child and help brighten up their day. I think they are an awesome product that kids everywhere will enjoy.